So, you're looking for a good high-pressure shower head. It could be because of a host of reasons - clogged water pipelines, low pressure in municipal water and whatnot. Fret not, because this quick buying guide will help you pick a shower head that matches your exact needs. An ideal shower head can boost our hygiene considerably. It helps us to wash the dirt and tiredness from ourselves, and freshen up for the rest of the day. Therefore, it is important to select the best shower head for having a proper bathing. If you have any corrosion or blockages in municipal water supply or the supply of your own plumbing system, you are likely to experience low flow of water pressure throughout the entire house. You need a complete plumbing checkup to get this fixed. On the other hand, you can get one of the best high pressure shower heads that are specially designed to deliver higher pressure. How to Find a Suitable High Pressure Shower Head? Do You Want a “Jet” or a “Rainfall” Showerhead? What Type of Finish do You want? After spending countless hours checking the available best options available on the market, I built this final list for you. These shower heads are designed in a way (with adjustable spray settings or special pressure chamber design) that can deliver higher water pressure with the same amount of water flow from municipal water supply or your own house plumbing system. The pressure chamber add air & pressure the shower water that force the water out at a high rate. Like I said in the intro, the right “High Pressure” shower head will deliver high-speed water and even save water when it needs to. But you need to be careful when selecting just the right accessory. All you have to is to remember these factors and ask the right questions before you decide to buy a model. Let us pull out our looking glass and see what these questions are. If you don’t know, shower heads can behave differently in different climatic influences. To best counter the climate changes, you get shower heads in two different spray types. One is aerated, and the other is Laminar-flow showerheads. Aerated shower heads infuse air when pouring water through the holes and onto your body. As a result, you get high-pressure water even in areas where water pressure is a great concern. 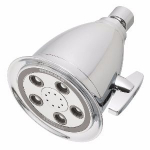 These shower heads are known to clean different areas of your body effectively. Also, these are particularly useful when you are living in dry conditions. Humid climate will result in these showerheads emitting steam. While this is good for people with coughs, mildews and fungus will be constant threats in this condition. Laminar-flow showerheads, on the other hand, are suited for any climatic condition you live in. The water comes out at a uniform spray that leads to even distribution of water all over your body. I mainly hinge for these shower heads over the others. You might have noticed that there are multiple types of shower heads that you can find in this category. Each has its own advantage and some “Not So Good” points. Take the fixed shower heads for example. These are cheaper than other types. These are generally attached to a shower thread and can swivel to adjust the angle. The spray patterns are dependable in the case of “Fixed Shower heads, ” and most of the times, you’ll find the control knob located at the head itself. These are great options when you are tied to a budget. On the other end of the spectrum, we have Dual Showerheads. These are a combo of a fixed mount shower head and a handheld variant. The latter is connected at the end of an extendable hose. These are on the expensive side of things. Particularly useful in areas with “Low Water Pressure”, these variants of the shower fittings deliver comprehensive cleaning. The fixed showerhead delivers high-pressure water from the top while the handheld version helps water in reaching the delicate parts of your body. These are my personal favorites when going in for a hot bath. Yes, you can use the handheld showerhead in a bathtub as well. With a “Jet” spray Showerhead, you get multiple spraying patterns. One of which may/may not include rainfall. The “Rainfall” showerheads are relaxing. But these high-pressure shower heads can quickly become monotonous. Plus, these often come fixed. As a result, you can’t clean these things all too well. But the Jet shower heads are more often than not “Self Cleaning.” I personally think the latter are the best high pressure shower heads. But these are a tad bit on the expensive side. Plastic is the most common material preferred. But if you are looking for a bit of lavishness, choose any of the other options too. While choosing a showerhead, be sure that it is mildew and corrosion resistant as well. A shower head is potentially a long-term investment. You don’t want a damage-prone product. In short, look at the amount of dollars you are willing to spend. As I said times and times over, there are two broad categories of these bathroom fittings. One that is cheap and the other that costs a bit. If you are at a fix with a low budget, go for the cheap ones. Luxury is not something you need every time. But be weary of the fact that depending on price cuts, you might lose a few perks, benefits and added attachments as well. These might not be good things to lose in the long run. So, think really hard about what you NEED and what you can spare before coming to an agreement with yourselves. Before you go & pick up a random high pressure shower head, check our in-depth reviews of each models below. The Speakman S-2251 Icon Anystream High Pressure Shower Head is made for robust performance and consistent shower flow in different water pressured areas. The shower head comes with standard 2.5 GPM flow control. You will not feel either extreme water-flow or the lack of it. The shower head will provide consistent water flow in different areas where water pressure is different. You will have safe and proper bathing experience with this showerhead. The self-cleaning nozzles along with Speakman® patented plunger system will ease your work in cleaning the shower filter. You will have the ability to use it for years without any hassle. You can watch the video review. This video created by our friend David Filo. The Speakman S-2252 Icon High Pressure Adjustable Shower Head comes with some advanced features to give you healthy and safe shower water for your daily bath. With Any stream technology, the adjustable shower head gives you the ultimate advantage to change the flow of shower with different spray settings. You can get yourself massaged or become immersed by an intense shower to soaking drenched pattern. If you want to enjoy your bathing with the full speed of water, choose that with full spray setting. This Speakman shower head provides an advanced feature called Speakman Patented Plunger System to enhance your bathing experience under different water pressure. That makes it suitable for various regions of the country where water pressure is variable. 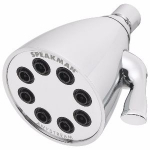 The Speakman VS-3014 Anystream High Pressure Shower Head is renowned for its flexibility along with superb built quality. 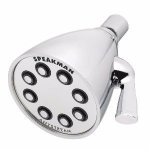 The shower head is made with Speakman engineering plastic with an excellent Polished Chrome finish. The plastic is extremely sturdy in nature with its lightweight. You will not face any problems of "Breaking the Showerhead" or issue with iron filtration with the showerhead for its high-quality components. The plastic does not absorb iron so the Speakman VS-3014 showerhead will last longer without any problems. With the stylish finish, the showerhead fits perfectly in a modern bathroom. You will not only enjoy the showerhead for long periods of, but it will also improve the look of your bathroom. The Speakman S-2005-HB Hotel High-Pressure Shower Head comes with some essential features like patented Anystream® 360° technology and self-cleaning nozzles. The Anystream® 360° technology helps the user to rotate the showerhead through 360 degree without any problem. Therefore, you will be able to control the stream to wash your body completely using least water. The self-cleaning nozzles not only offer you consistent smooth shower flow, but also give you the option to clean it quickly. You will enjoy an excellent performance in shower flow even in low water pressure. Aqua Elegante 6 Function Shower Head is one of the top fixed high-pressure shower heads around at this point in time. No matter what the water pressure levels are, you can always count on Aqua Elegante to remove oil and dirt from your body. This is thanks to the 6 different spray settings that deliver water at a high-pressure level. You can choose from Gentle Rain, Pulsating Massage, Water Saving Spray and even Power Blast which grants you a full power boost to have a thorough cleaning. Then there are two “Combined Modes” that you have to combine any of the four to great effect. It is made of ABS plastic that is super durable. Also, Aqua Elegante goes well with polished brass, chrome, brushed nickel, and even oil rubbed bronze fittings. In short, your showering space will look cooler with this one in place. Of course, it delivers 2.5 GPM of water, but it has a “Flow Restrictor” around the neck to ensure that. When you remove the restrictor, the water it delivers goes well beyond 2.5 GPM. The nozzles usually don’t clog. Even if they do, they clean themselves. 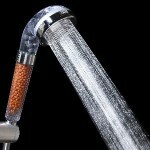 This is the perfect showerhead to be used in RV or even outdoors. With an impressive warranty period, this one surely lasts longer than its competitors at this price range. Design comes without any flaws. You can fit it in any type of bathroom you want. Wide range of spraying options available. You can get more than 2.5 GPM water by removing the water restrictor. I couldn’t find any negatives with this. 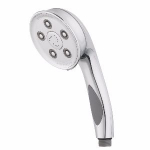 WantBa Rainfall High-Pressure Shower Head comes with rubber nozzles that allow you to have high water pressure even when the area you live in has a low-pressure count. Want Ba Showerhead is made of high-performance ABS plastic. I call this a “Hybrid” since it blends the “Jet Shower Head” and the “Rainfall” one. It comes with 57 jets, and all these are placed within 6” diameter. This allows Want Ba to be the best High Pressure Shower Head in its league. This one features a metal swivel ball that lets users adjust the angle of the shower head. You can even disassemble the whole thing. As a result, cleaning the intricate parts and maintenance of the fixed showerhead becomes easy. This High-Pressure Shower Head allows you to have water flow as much as 2.5 GPM. So, it is a perfect candidate for areas where water pressure and quantity are important issues. For a cheap shower head, it is big on power. It has great spraying patterns. The spray doesn’t cover your whole body. With Hydroluxe, you’ll get a shower head and a handheld shower comb﻿o. That makes it a winner in its own right. On top of that, it is a luxury bathroom fitting with all the functions you can expect from a modest-price product. I had the luxury of choosing from 24 combined and standalone water flow patterns while using this thing. Believe me, while going through 5 different spray settings like Rainfall, Pulsating Massage, Economy Rain, Pause and “Stay-Warm Mist,” you’ll have a showering experience of a lifetime. I turn both the handheld shower and the shower head on for a full shower. If you are not a fan of either one of these things, you can turn any of the two off and still enjoy a quality shower. You can adjust the shower head’s water capacity using the 3-click-lever adjustment system which is great if you have different people at home who enjoy different types of water sprays. It is handy when you want a cheap dirt removed from your body too. Hydroluxe achieves 2.5 GPM water pressure at its highest. As a dual-design shower head (fixed and handheld) it is pretty affordable too. Dual Showerhead design is a massive plus. Two showerheads offer much needed versatility. The pressure is “High” as most people would like. 24 different spray settings provide spa-like environment. There’s no way to increase water pressure when two showerheads are at work at the same time. This Single-Function Shower Head from Delta allows you to enjoy a 360-degree rotation while bathing. People can connect 75152 with ½” shower arms. Luckily, you’ll get all the things you need to assemble this product included in the package. The assembly process is quick. This plastic shower head offers you large spray holes. The design further guarantees that these holes won’t clog. This shower head has a perfect design for low water flow and delivers you water pressure that makes it feel like normal flow. You can conveniently save water by using “Volume Control”. This shower head delivers water at two distinct speeds. Level one gives you 1.85 Gallons of water/minute. The level two offers 2.5 gallons of water/per minute. People can switch between two speeds using a control lever. This high-pressure shower head meets the WaterSense requirements of EPA. Delta 75152 saves 36% water than its counterparts. The result? It will save more than a few bucks as your water bill drops. This showerhead is easy to install. It is perfect for head to toe drenching showers. Saves a decent amount of water. Spraying surface is large, covers all the basic parts. The ZenFresh Filtration Shower Head is designed in a way that takes special care of your hair and skin. It provides you filtered body spray with purifying chlorine, negative ion and other harmful chemicals. The filtered shower stream will make you fresh without changing the natural oil portion of your body and hair due to chlorination. For the lovely features, it ranked # 2 in our top quality high pressure shower head list. It is an ideal tool for environment enthusiasts as every part of it, including the packaging can be recycled, and it does save water. The eco-friendly water saving technology does not harm the flow of the shower so you will have a proper bathing experience. Bioactive stones help restore balance in oil glands. The “Overflow” technology of this shower head allows you to enjoy decent shower where the water quantity and pressure is low. Waterpik SM-421 shower head is cheaper than its counterparts. Still, it provides four different spray settings including a “Pulsating Massage” that is more than useful. People, including non-professionals, can install this thing in minutes. It is helpful when you are looking for a quick fix for the “Shower” problem you are facing and without the plumbing costs. For a “Low Cost” showerhead, WaterPik SM-421 provides water at 2.5 Gallons Per Minute. This one also comes with a good warranty. This is a definite plus for a cheap showerhead. It fits with most shower threads that you come across. This aspect further reduces your installation costs. Four different settings work really well. Overflow technology delivers adequate water for “Low Pressure” areas. All of these five shower heads featuring in our best high pressure shower head list are good with some similarities and distinct kind of features. Consider the size of your bathroom and main benefits before plunging to buy one from the market. Of course, not every shower head is suitable for everyone. So before buying, always do a check-in with your needs. Best Shower Valve – Selections From A Pro! A Guide to Buying the Best Shower Filter 2019 – Top 10 Selections!